Magento is no doubt the most powerful open source e-commerce software, it is used to power many large popular online stores. It has a wealth of features in the base product which can be extended with extensions and themes. Some of the benefits of choosing Magento for your online store include. Magento is the most popular commerce platform in the world, with more than 300,000 merchants around the globe. The Magento Marketplace is the world’s largest and most versatile offering of customized and tested extensions. An average, merchants using Magento grow faster than those on competitive platforms. Of course, it is no good having great features for your online shop if the design doesn’t match – e-commerce themes & templates are especially important that they work on every type of browser from desktop to mobile and tablet which means they need a responsive design. They should also be fast loading as any delay could potentially lose your sales. 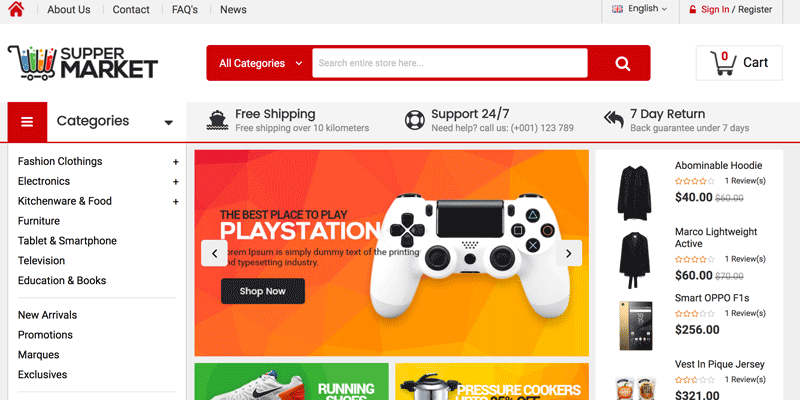 Supermarket Responsive Magento Theme is the best design, fully responsive and html5/css3 supported. The supermarket is designed with a simple, clean and clear method. The Trendsetter is a superb market for marketing fashion, jewelry, accessories products. If you want to have a very different and attractive design and trying to make your way to various store owners, templates.vip is a great starting point for new fresh and modern ecommerce templates. 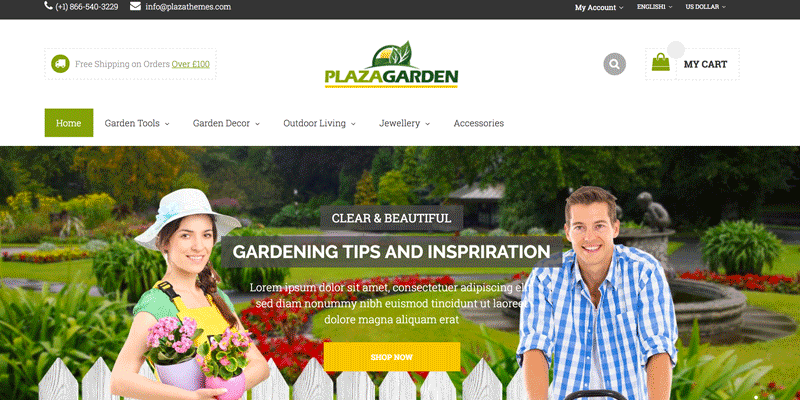 Finding a website to sell convenience garden tools and plants – Plaza garden Magento Theme is a great selection for you. Four homepage layouts with a simple structure and great color, you can customize the website according to you. Green is the main color with white background and black text. The structure is neat and clean with some simple modules: Product Tabs Slider, Products Slider modules are arranged in a vertical or horizontal direction. Instagram Gallery and Blog are the highlights with nice images, helpful information via beautiful pictures and posts. Social network users are growing much more and so, using social networks in your business is very important. Advertising banners about garden tools, hand tools, plants, trees, flowers, sale-off are displayed logically in each cms block. Also, can advertise with big banners below Megamenu – via Custom Slideshow. Smooth effects and responsive on mobiles, it’s very convenient. SEO is better with Google Rich Snippets on the Product page. Layered Navigation helps customers filter products by price, color, manufacturer, size. 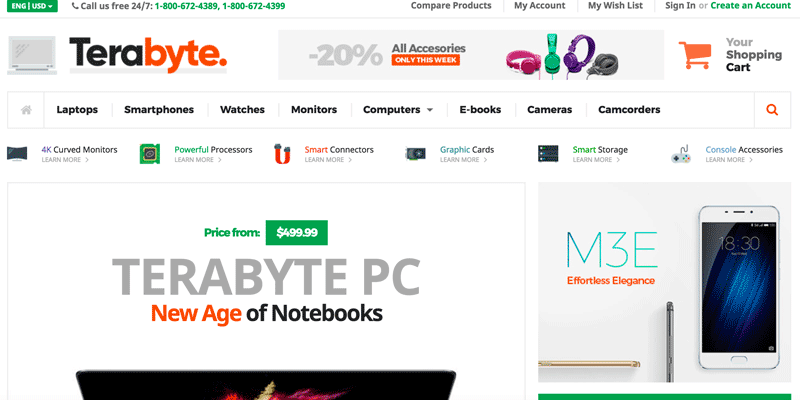 Terabyte – is a premium Magento 2 theme from Magee suitable for any kind of online stores. We always do our best to keep our themes updated. Since we are the publisher of just theme, we do not provide support which concerns any 3-rd party extensions, including modules that come with the theme. 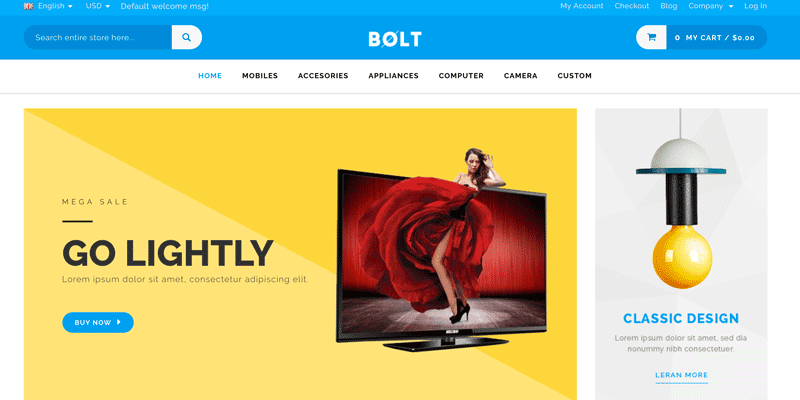 Bolt is a sensitive multipurpose Magento theme which is fully customizable and suitable for any kind of Magento store on any device. This responsive theme is a common purpose conscious theme which can be highly customized and tailored for any heavy Magento store. Google fonts available to choose from admin setting. Easy custom home page and slide show banner. Best Seller & Featured products on homepage. Related product slider on product details page and header dropdown shopping cart. Multiple Language support and back to top button. Scroller Thumbnail images in the product page. Cloud zoom option for product Images. Powerful Admin Module Easy to customize Magento template. Magento is so popular now with several thousands of stores available, it is too puzzled for anyone to make a good choice. These beautiful Magento themes converge all the powerful features in a graceful look, are ready to catch attentions & to boost the user experience. When you own a good looking store, you will be a winner. Most Best Magento themes are designed with large Responsive Web Design, therefore the website can be displayed perfectly on all devices, such as desktop, iPhone, iPad, Smartphone Android, Tablet Android. This will give your store a consistent look in no matter which devices the customers are using. Also, they can shop at your online store anytime, anywhere. and build professional eCommerce store with easy, well-structured layout, colors, and texture creates the theme customers a friendly viewing in customer’s eyes.